EAWL Homecraft Exhibition : KEG participated in EAWL homecraft exhibition which was held from 18th to 20th September. 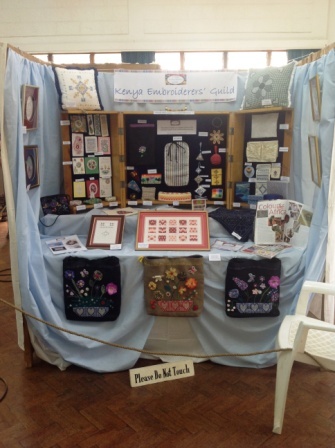 This exhibition gives members an opportunity to see a huge variety of exquisite and inspiring craftwork. 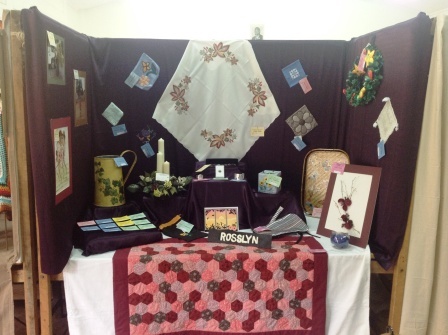 The KEG displayed all its kits and pieces from Mary’s classes, and publicity information. September and October 2-part kit! 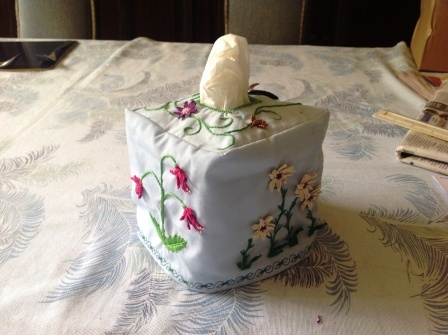 It makes this amazing tissue box cover, featuring woven picots, and is really beautiful. 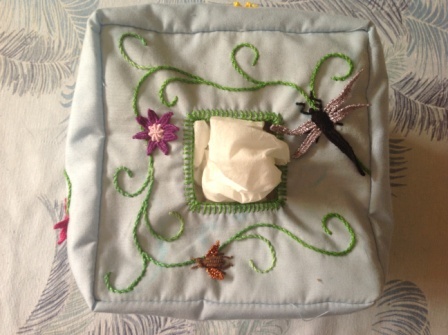 It is a tissue box cover with four different sides and a top featuring a dragonfly! The first part conducted in September covered the ‘foundation stitches’ ie the stem, chain, satin, blanket etc stitches, and in the October meeting Gail tought the woven picots. 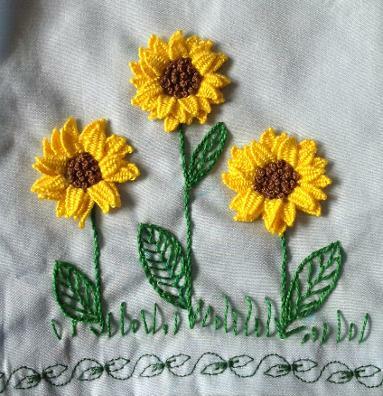 This kit ended up much more elaborate than originally imagined, as Gail was having such fun designing the flowers and insects, and incorporating as many stitches as possible. Satin stitch – the critical thing here is to keep stitching in the same direction – although it is tempting to go backwards and forwards to save thread, DON’T DO IT, it won’t look right. If you don’t mind what the back looks like, it is really helpful to do a few stitches spaced across the area to be filled, then to go back and fill them in. In this kit, for the fuchsia leaves, do some spaced stitches from the edge of the leaf to the centre on each side, then draw the scalloped edges between these stitches, then fill in the spaces.